Nationality: Austrian. Born: Jonas Sternberg in Vienna, 19 May 1894. Education: Educated briefly at Jamaica High School, Queens, New York, returned to Vienna to finish education. Family: Married 1) Riza Royce, 1926 (divorced 1930); 2) Jeanne Annette McBride, 1943, two children. Career: Film patcher for World Film Co. in Fort Lee, New Jersey, 1911; joined U.S. Army Signal Corps to make training films, 1917; scenarist and assistant for several directors, 1918–24; attached "von" to his name at suggestion of actor Elliot Dexter, 1924; directed first film, The Salvation Hunters , then signed eight-picture contract with MGM (terminated after two abortive projects), 1925; directed The Sea Gull for Charlie Chaplin (Chaplin did not release it), 1926; director for Paramount, 1926–35; began collaboration with Marlene Dietrich on Der blaue Engel , made for UFA in Berlin, 1930; attempted to direct I, Claudius for Alexander Korda in England, 1937 (not completed); made documentary The Town for U.S. Office of War Information, 1941; taught class in film direction, University of Southern California, 1947. Awards: George Eastman House Medal of Honor, 1957; honorary member, Akademie der Künste, Berlin, 1960. Died: 22 December 1969. Daughters of Vienna , free adaptation of stories by Karl Adolph, Vienna, 1922. Dokumentation, eine Darstellung , Mannheim, Germany, 1966. The Blue Angel (screenplay), New York, 1968. Interview, in Motion Picture Classic (New York), May 1931. "On Life and Film," in Films in Review (New York), October 1952. "More Light," in Sight and Sound (London), Autumn 1955. "Acting in Film and Theater," in Film Culture (New York), Winter 1955. Interview with D. Freppel and B. Tavernier, in Cinéma (Paris), March 1961. "The von Sternberg Principle," in Esquire (New York), October 1963. "Sternberg at 70," with John Pankake, in Films in Review (New York), May 1964. Interview with Peter Bogdanovich, in Movie (London), Summer 1965. Interview with F. A. Macklin, in Film Heritage (Dayton, Ohio), Winter 1965–66.
" L'Ange bleu ," in Avant-Scène du Cinéma (Paris), March 1966. Interview with Kevin Brownlow, in Film (London), Spring 1966. Walker, Alexander, The Celluloid Sacrifice , New York, 1967. Anthologie du cinéma , Vol. 6, Paris, 1971. Studlar, Gaylyn, In the Realm of Pleasure: Von Sternberg, Dietrich, and the Masochistic Aesthetic , Urbana, Illinois, 1988. Zucker, Carole, The Idea of the Image: Josef von Sternberg's Dietrich Films , Cranbury, New Jersey, 1988. Bowman, Barbara, Master Space: Film Images of Capra, Lubitsch, Sternberg, and Wyler , London, 1992. Baxter, Peter, Just Watch! Sternberg, Paramount, and America , London, 1993. Bogdanovich, Peter, interviewer, Who the Devil Made It , New York, 1997. Pringle, Henry, "Profile of Josef von Sternberg," in the New Yorker , 28 March 1931. Harrington, Curtis, "Josef von Sternberg," in Cahiers du Cinéma (Paris), October/November 1951. Labarthe, André, "Un metteur en scène baudelairien," in Cahiers du Cinéma (Paris), April 1956. Weinberg, Herman G., "The Lost Films, Part 1," in Sight and Sound (London), August 1962. Smith, Jack, "A Belated Appreciation of von Sternberg," in Film Culture (New York), Winter 1963/64. Green, O.O., "Six Films of Josef von Sternberg," in Movie (London), no. 13, 1965. Weinberg, Herman G., "Sternberg and Stroheim—Letter," in Sight and Sound (London), Winter 1965/66. Kyrou, Ado, "Sternberg, avant, pendant, après Marlene," in Positif (Paris), May 1966. Camper, Fred, "Essays on Film Style," in Cinema (London), no. 8, 1971. Flinn, T., "Joe, Where Are You?," in Velvet Light Trap (Madison, Wisconsin), Fall 1972. Gow, Gordon, "Alchemy: Dietrich and Sternberg," in Films and Filming (London), June 1974. Wood, Robin, "Sternberg's Empress: The Play of Light and Shade," in Film Comment (New York), March/April 1975. Willis, D., "Sternberg: The Context of Passion," in Sight and Sound (London), Spring 1978. Articles from Ciné-Magazine reprinted in Avant-Scène du Ciné (Paris), 15 March 1980. Luft, Herbert, "Josef von Sternberg," in Films in Review (New York), January 1981. Magny, Joel, "Josef von Sternberg: la lumière du désir," in Cinéma (Paris), December 1982. Von Sternberg Section of Skrien (Amsterdam), April/May 1985. Baxter, Peter, " Blonde Venus : Memory, Legend, and Desire," and Florence Jacobowitz, "Power and the Masquerade: The Devil Is a Woman ," in CineAction! (Toronto), no. 8, 1987. Ciment, M. "Josef von Sternberg," in Positif (Paris), January 1991. Sobchack, V., and L. Poague, in Film Quarterly (Berkeley), Spring 1990. Poague, Leland, in Hitchcock , 1993. Morgan, M., "Sternberg and Dietrich Revisited," in Bright Lights (Cincinnati), no. 10, July 1993. Wilson, E., "Hats Off," in Sight and Sound (London), vol. 3, no. 12, December 1993. Hall, K. E., "Von Sternberg, Lubitsch, and Lang in the Work of Manuel Puig," in Literature/Film Quarterly (Salisbury, Maryland), vol. 22, no. 3, July 1994. Von Stroheim, E., " Glamour et photographie," in Positif (Paris), no. 403, September 1994. The Epic That Never Was—"I, Claudius, " directed by Bill Duncalf, for BBC-TV, London, 1966. There is a sense in which Josef von Sternberg never grew up. In his personality, the twin urges of the disturbed adolescent towards self-advertisement and self-effacement fuse with a brilliant visual imagination to create an artistic vision unparalleled in the cinema. But von Sternberg lacked the cultivation of Murnau, the sophistication of his mentor von Stroheim, the humanity of Griffith, or the ruthlessness of Chaplin. His imagination remained immature, and his personality was malicious and obsessive. His films reflect a schoolboy's fascination with sensuality and heroics. That they are sublime visual adventures from an artist who contributed substantially to the sum of cinema technique is one paradox to add to the stock that make up his career. Much of von Sternberg's public utterance, and in particular his autobiography, was calculated to confuse; the disguise of his real Christian name under the diminutive "Jo" is typical. Despite his claims to have done so, he did not "write" all his films, though he did re -write the work of some skilled collaborators, notably Jules Furthman and Ben Hecht. While his eye for art and design was highly developed, he never designed sets; he merely "improved" them with props, veils, nets, posters, scribbles, but above all with light. Of this last he was a natural master, the only director of his day to earn membership in the American Society of Cinematographers. Given a set, a face, a camera, and some lights, he could create a mobile portrait of breathtaking beauty. Marlene Dietrich was his greatest model. He dressed her like a doll, in a variety of costumes that included feathers and sequins, a gorilla suit, a tuxedo, and a succession of gowns by Paramount's master of couture, Travis Banton. She submitted to his every demand with the skill and complaisance of a great courtesan. No other actress provided him with such malleable material. With Betty Compson, Gene Tierney, and Akemi Negishi he fitfully achieved the same "spiritual power," as he called the mood of yearning melancholy which was his ideal, but the effect never equalled that of the seven Dietrich melodramas. Von Sternberg was born too early for the movies. The studio system constrained his fractious temperament; the formula picture stifled his urge to primp and polish. He battled with MGM, which offered him a lucrative contract after the success of his von Stroheimesque expressionist drama The Salvation Hunters , fell out with Chaplin, producer of the still-suppressed Woman of the Sea , and fought constantly with Paramount until Ernst Lubitsch, acting studio head, "liquidated" him for his intransigence; the later suppression of his last Paramount film, The Devil Is a Woman , in a political dispute with Spain merely served to increase von Sternberg's alienation. For the rest of his career, von Sternberg wandered from studio to studio and country to country, always lacking the facilities he needed to achieve his best work. Even Korda's lavish I Claudius , dogged by disaster and finally terminated in a cost-cutting exercise, shows in its surviving footage only occasional flashes of Sternbergian brilliance. By World War II, he had already achieved his best work, though he lived for another 30 years. Von Sternberg alarmed a studio establishment whose executives thought in terms of social and sexual stereotypes, formula plotting, and stock happy endings; their narrative ideal was a Saturday Evening Post novelette. No storyteller, von Sternberg derided plot; "the best source for a film is an anecdote," he said. From a single coincidence and a handful of characters, edifices of visual poetry could be constructed. His films leap years in the telling to follow a moral decline or growth of an obsession. The most important film of von Sternberg's life was one he never made. After the humiliation of the war years, when he produced only the propaganda short The Town , and the nadir of his career, as closeup advisor to King Vidor on Duel in the Sun , he wrote The Seven Bad Years , a script that would, he said, "demonstrate the adult insistence to follow the pattern inflicted on a child in its first seven helpless years, from which a man could extricate himself were he to realize that an irresponsible child was leading him into trouble." He was never to make this work of self-analysis, nor any film which reflected a mature understanding of his contradictory personality. Von Sternberg's theories of cinema were not especially profound, deriving largely from the work of Reinhardt, but they represented a quantum jump in an industry where questions of lighting and design were dealt with by experts who jealously guarded this prerogative. In planning his films not around dialogue but around the performers' "dramatic encounter with light," in insisting that the "dead space" between the camera and subject be filled and enlivened, and above all in seeing every story in terms of "spiritual power" rather than star quality, he established a concept of personal cinema which presaged the politique des auteurs and the Movie Brat generation. In retrospect, von Sternberg's contentious personality—manifested in the self-conscious affecting of uniforms and costumes on the set and an epigrammatic style of communicating with performers that drove many of them to frenzy—all reveal themselves as reactions against the banality of his chosen profession. 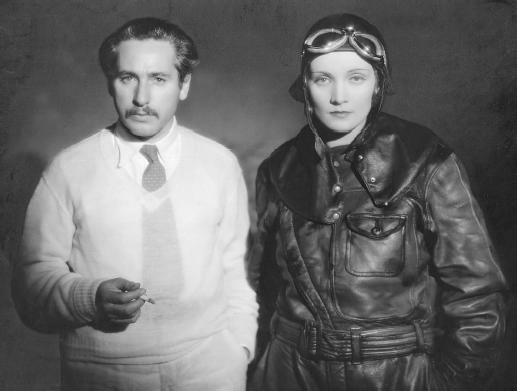 von Sternberg was asked late in life if he had a hobby. "Yes. Chinese philately." Why that? "I wanted," he replied in the familiar weary, uninflected voice, "a subject I could not exhaust."